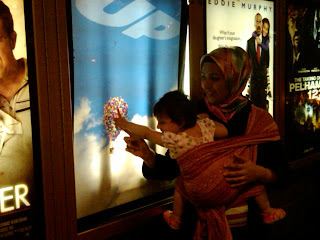 We took Iza to see Up! in theater. It was a Tuesday discount night, and not many people besides other kids inside. She was a bit freaked out but with the help of the right snacks (carrots and nachos!) she learned to relax and even pointed at the baloons. I can't wait for another animated worth watching so I can take her again.